LED Energy Savings Calculator. Compare LED electricity savings to CFL or Incandescent lights. The LEDs on Flexfireleds.com have a life rating of 50,000hrs. This means that with optimal conditions our LEDs will last over 40x longer than a 1,500 hour light bulb. This also means that it would take 40 light bulbs to last as long as one of our LEDs not to mention having to go to the store to buy the other bulb then have to replace it. The light savings with LEDs is incredible! Do some trees a favor and buy one! 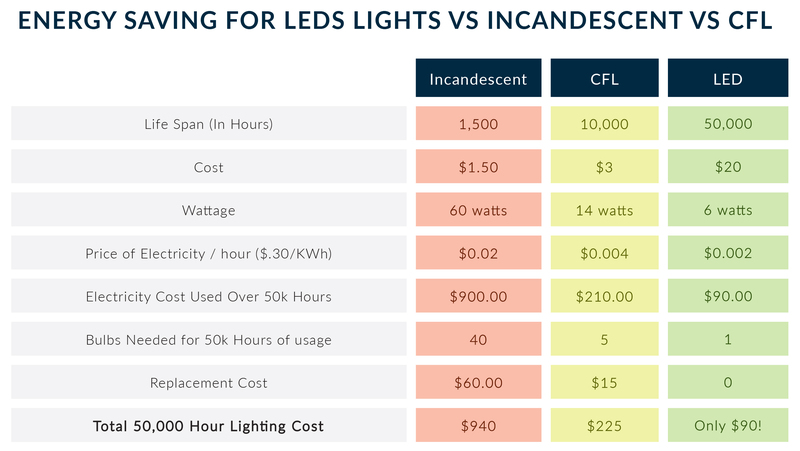 Please see below to compare the costs and money savings with LED flexible light strips vs incandescent and CFLs.